In the IMF’s most recent Article IV on the US (here), they made the case for the Fed to hold off on raising rates until 2016. One of the factors that they pointed to was the experience of Sweden in recent years, who raised rates, only to have to cut them again even more more aggressively. The Fund argue that the Riksbank made a policy error by hiking too early, leading to an aborted recovery. Moreover, they say that the Riksbank’s credibility has been damaged. The US should therefore try to avoid both those outcomes. In this post I want to focus on whether the Swedish comparison is a reasonable one for current Fed policy. How similar are the Swedish and US economies? Sweden is a small, open economy. It has a population of under 10 million and gross trade (exports plus imports) is nearly 50% of GDP. Around 70% of its exports go to the EU. Given its size and openness, global trade and financial conditions have a large impact on the domestic economy (in a classic M-F model, Sweden must accept the global interest rate as exogenous). The exchange rate is floating and has acted as a shock-absorber, trading in a range of +/- 30% (in trade-weighted terms) over the past 15 years. The role of the state is significant in Sweden, with the total tax revenue as % GDP of over 40%. The US is a large, (relatively) closed economy. It has a population 320 million and gross trade is under 15% of GDP. Given its size (and status as global reserve currency), the US heavily influences the global interest rate. The trade-weighted dollar has traded in a relatively wide range of around +/- 20% since 2000. The state is relatively small, with total tax revenue as % of GDP just 25%. So structurally these are two very different economies. But the objective of the Riksbank and the Fed are pretty similar, with both inflation targeting central banks. Unlike the Fed, the Riksbank does not have a full employment leg to their objectives, but does have responsibility for financial stability (something that has impacted monetary policy decisions in Sweden in recent years). What was the Riksbank policy error? Like everyone else around the world, Sweden got caught in the global financial crisis of 2008. Indeed, as a small, open economy they suffered more than most. From the peak in 2007Q4, the level of GDP fell by nearly 8% in Sweden through to early 2009, double that in the US and considerably more than the 5% fall in the euro area. Like elsewhere around the world, policy rates were slashed to an unprecedented level of 0.25%. But despite the sharp decline in Sweden, growth recovered more quickly than elsewhere, and by late-2010 was “booming” at nearly 8% year-on-year. Indeed, by 2010Q4 the level of GDP in Sweden was around 1% higher than the pre-crisis peak, bettering the US and the EA. The Riksbank had seen the recovery picking up pace in Sweden and decided in June 2010 to start the process of normalising the policy rate, raising it by 25bp and indicating that it expected to raise it steadily (around 100bp/year) over the coming 3 years. In their statement, the bank noted that consumer and business confidence were back to their pre-crisis peak, investment was growing strongly and trade was also improving (despite a slower global outlook). They noted the fiscal issues in the euro area, but didn’t see it as enough to derail the Swedish recovery. Their report said that resource utilisation (output gap) was still slightly negative (-0.5%) but that slack was rapidly diminishing. Finally, they were content to hike despite their expectation that in the short-term inflation would fall well below target (due to weak wage growth and strong krona), as medium-term the forecast showed a return to 2%. The Risksbank then proceeded to hike rates by 25bp at each meeting thereafter, until they reached 2%. During this period growth turned out to be even stronger than they had expected, inflation declined as expected, and the troubles in the euro zone worsened. Throughout this whole period there were two dissenters on the Riksbank board, Svensson and Ekholm. Each meeting the objected to hiking, but only to the marginal increase. Ie, they also ratcheted up their votes, but with a lag of one meeting. The final hike came in July 2011. They noted that underlying inflation pressures remained low, but were expected to increase. Wage growth had picked up a bit and was expected to rise more quickly as the labour market tightened. They expected to continue hiking rates, albeit a little slower, up to 3.75% by mid-2014. Even the dissenters did not disagree with the end-point, just the path to getting there. It was not clear at that moment that a significant policy error had occurred. But there was a rather prescient box in the report that accompanied the decision. It considered a downside risk scenario, whereby events in the euro area worsened materially, impacting both trade and financial conditions in Sweden. Under this scenario, rather than policy rates continuing to steadily rise, they would instead need to be cut fairly rapidly back to 1% (before steadily rising again). 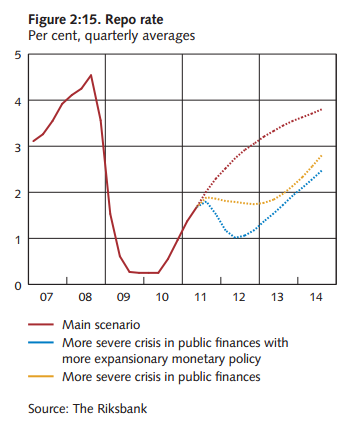 The chart below shows the impact of that scenario on the policy rate (blue dotted line). That risk scenario turned out to be the central case. In less than 6 months the Riksbank cut rates by 25bp, almost exclusively attributing the problems in the euro area as the reason for the change in policy. Over the following 3 years (2012-2014) policy was gradually eased, as the euro area fell every further into recession and as fears of the disinflationary impact of an even stronger Krona grew. Inflation continued to undershoot the target, and indeed fell into negative territory. So what was the policy error? Was it that the Riksbank didn’t put enough weight on the risk of the euro area malaise worsening? Was it that they simply didn’t think it would have a significant enough impact on Sweden? Or were there domestic factors at play around the growth/inflation trade-off changing? All of these are plausible candidates, but could anyone have got these right in mid-2010 when the hiking cycle began? Yellen has said that it shows the risk of hiking when the equilibrium real rate is still low. But consumption and investment were growing very strongly at that point, and trade was recovering. No one knew quite how severe the problems in the euro area were going to be (indeed the ECB infamously hiked rates themselves in 2011!). Real-time, I think it was hard to argue that equilibrium rates weren’t already rising in Sweden. Rather, I think the real policy error in Sweden came in the 2012-14 period, when rates were not cut fast enough. Despite reasonable growth, persistent below-target inflation saw inflation expectations becoming de-anchored on the downside. And financial stability risks were used as an argument for not cutting so aggressively (due to the risks around ballooning house prices and household debt). Is it a good case study for the Fed in 2015? If you have made it this far through the post, you will not be surprised to hear that I do not think the Swedish example is a good one for thinking about Fed policy in 2015. One can argue about how much the Riksbank should have raised rates in 2010/11, but I think it is pretty hard to make a case that they should not have hiked at all (or delayed for longer). A small, open economy was subsequently battered by events in the rest of Europe, which required a change in the policy direction. There could be a shock come along that throws the US economy off track in a similar way. And some would argue that is enough when you are at the zero bound to delay hiking until the economy is really motoring. But on many metrics the Fed has already waited much longer than in the past to start the hiking cycle. To wait too long would risk a much more rapid (and potentially very damaging) succession of rate hikes. I don’t want to give the impression that this post has covered all the complexity of the policy decisions at the Riksbank over a period of nearly 5 years. It clearly hasn’t. And I have steered clear of turning this into an econometric exercise. But I guess my key point is that these sort of comparisons are thrown out there by such eminent institutions as the IMF and the Fed, seemingly without much analysis/substance behind them. They then get picked up by market participants and become part of the narrative for rates market. But I would urge caution on over-interpreting such comparisons, even when they come from the Fed Chair! (Lastly, if anyone could point me in the direction of a paper on this topic from either the Fed or the IMF, it would be much appreciated).